What would society look like if it did not promote the idea “that we are primarily a danger to ourselves and others”? In his latest philosophical exploration of mind, selfhood, and desire, prolific British psychoanalyst Phillips (Becoming Freud: The Making of a Psychoanalyst, 2014, etc.) 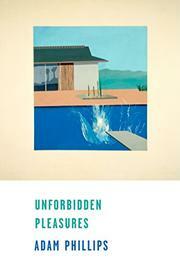 asks how the idea of forbidden pleasures shapes thought and behavior. “This book,” he writes, “is about whether the unforbidden pleasures have something more to tell us, or at least something else to tell us, about pleasure than the forbidden ones.” The “tyranny of the forbidden,” he maintains, “is not that it forbids, but that it tells us what we want—to do the forbidden thing.” What is forbidden, then, “narrows our minds, narrows our picture of ourselves”—in short, it circumscribes our freedom to know ourselves. Phillips draws on wide-ranging sources from literature (Shakespeare, Milton, Wilde), philosophy (Nietzsche, Jonathan Lear, Stuart Hampshire), and psychology (Freud, of course, and also Jacques Lacan, D.W. Winnicott, and neuropsychologist Brenda Milner) in his discussions of obedience, self-criticism, sexual taboos, and the concept of the superego. “The Freudian superego,” writes Phillips, “is a boring and vicious soliloquist with an audience of one,” a “made-up voice” distinct from the religious and cultural legacy of conscience. The patient undergoing analysis “discovers he is the casualty of forgotten obediences,” not all of which he may want to discard. Psychoanalysis encourages a conversation about the forbidden, allowing the patient a chance to make choices “about which rules he believes are worth following, and which rules he has merely been following, consciously or unconsciously, for fear of punishment.” Finding pleasure in the unforbidden, Phillips suggests, means “finding new kinds of heroes and heroines (or dispensing with them)” and redefining what we mean by satisfaction. A dense, challenging, provocative meditation on morality and identity.